Do you remember those Time Life books “A Day in the Life of ” that came out in the 1980s? The books were collections of images made by a gang of photographers who were let loose in different parts of the same country with the challenge of photographing all day from sunrise and into the night in their part of the country. I loved those books and they inspired me. I used to get one or two for Christmas each year when I was a teenager and I would sit for hours going through the images and planning my travels. Now that I am a photographer and a traveler, I have often thought about those books. I would love to recreate that project, but obviously I cannot be in many parts of a country at the same time. But when we got to Paris in early October, I decided to try something similar; I gave myself the task to photograph Paris from sunrise until darkness. Obviously, I couldn’t be everywhere at once, but Paris is easy enough to traverse on foot, bus, and metro, so I knew that I could cover a fair amount of the city in a single day. Matt supported this idea, even though he thought that I was a bit crazy. I probably was and am crazy, but as glamorous as it may sound to be traveling all the time, it is tiring and I was losing focus with my photography. I know in the past when I get into a slump with my image making, the best cure is to challenge myself with learning a new technique, photographing a tough subject, or giving myself a project. Challenging myself with this all-day project would be a great experience. Matt came along to shoot some video that we will post on our travel blog site when it’s ready. He also took some still photos – two in the gallery below are Matt’s. They were so good that I just had to include them. I spent time plotting out our path for the day. I wanted to start with the Eiffel Tower and end with the Eiffel Tower. I know that it’s the most photographed building in Europe if not the whole world, but there is a reason. Every photograph of the tower is different and beautiful. It’s a building that means something to everyone who sees it and I honestly get a bit teary every trip Paris and see it for the first time on that trip. In the course of the day, we walked just under 12 miles and covered Paris from Montparnasse up to Montmartre and pack again. We left our flat in Montparnasse at 6:20 in the morning and got back at 11 pm. I tried to narrow down the images to just my absolute favorites from the day, 17 in all. I am pleased with the results and would do it again. In fact, if you are feeling a bit blocked with your photography, why not do something similar? It is exhausting, but so much fun. Even if you don’t go all day, I highly recommend getting up before the sun comes up and photographing any big city at sunrise. Thank you for following. I hope that you enjoy the images. 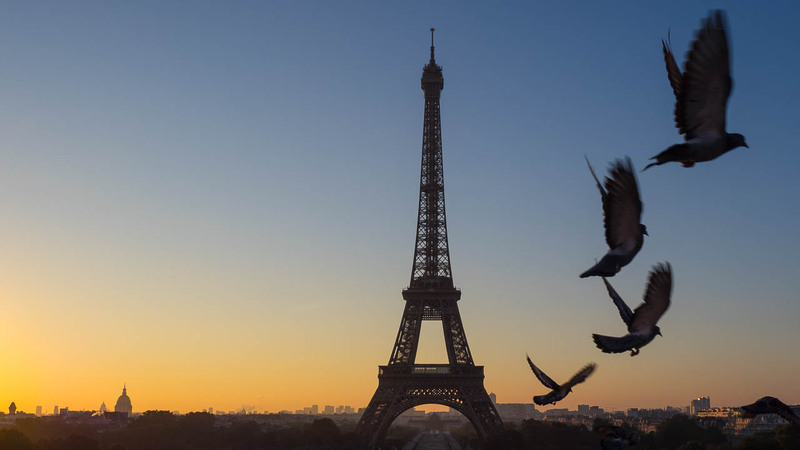 Love the Eiffel Tower with the birds! Also the statue looking down over the city. Hello Sheila! Thank Sheila! Paris is just one of those cities that is beautiful from any angle so it is a joy to photograph there. Morning Eiffel Tower is great, also love the Metro (?) shot! Looks like you had a nice day for picture taking. I see a few familiar spots. Didn’t we eat at the Cafe? We are looking forward to the Ireland trip! Thank you, Ruth Ann. We had a great time. It was exhausting, but fun. I don’t think that we did eat at that cafe, you mean the one with the lady sitting outside? I haven’t eaten there. But let’s go back and try it out. I am excited for the Ireland trip too and am so happy that you will be going. What a great post and absolutely beautiful photos! You are so talented! So many of the places in Paris you’ve featured have become cliche, but I love how you’ve presented them in a new, fresh way. That first Eiffel Tower photo is especially gorgeous. p.s. I found your website from GLT on FB. Thank you so much, Shareen! I’ll check out your blog for sure!